They may be covered in fur, but dogs are susceptible to sunburn just like their human companions. Repeated sunburn can increase a dog’s risk for skin cancer, so the more you limit your dog’s exposure to the sun, the better you can protect his overall health. However, if your dog does suffer a sunburn, prompt veterinary intervention can minimize the damage. In many cases, treatment involves simply cleaning the wound and applying topical ointments to ease the symptoms. Sunburn most commonly occurs on areas of exposed skin, such as where the nose and muzzle meet and on the back or the stomach. Dogs who have little or no hair, and those with light-colored fur, are also at greater risk. This risk increases if they spend extended periods of time in the sun. Also at greater risk are dogs who have hair loss due to a medical condition or have had their hair shaved for a medical procedure. Certain breeds also have a greater risk of sunburn. This includes Dalmatians, boxers, Basset hounds, beagles, bull terriers and American Staffordshire terriers. Superficial partial thickness is the least severe and most common type of dog sunburn and is similar to a first-degree burn in humans. The skin will be red and might appear scaly, and there might also be some hair loss. A deep partial thickness burn, or second-degree burn, is characterized by red skin and involves the surface of the skin and some of the underlying layers, which may be exposed. Full thickness burns, or third-degree burns, involve every layer of the skin and might extend into the tissue just beneath. The skin might be white or have a leathery appearance. Take your dog for a medical evaluation immediately and don’t administer any treatment before you consult a vet. However, you can apply a cold compress to the skin to ease the sting of the burn. Treatment includes shaving the area and cleaning it with a solution such as povidone iodine or chlorhexidine. Minor burns typically require an initial vet visit with ongoing treatment administered by the owner at home. A sunburn can make a dog vulnerable to secondary infection, so your vet might prescribe antibiotics. Apply sunscreen to your dog’s skin before any sun exposure. Choose one formulated for dogs or a human version that’s safe for babies and people with sensitive skin. Avoid zinc oxide and PABA, which the United States Dog Agility Association notes can be toxic to dogs if ingested. The USDAA also notes that some veterinarians recommend using a sunscreen with avobenzone, also called Parsol 1789. You can also block the sun’s rays with lightweight, light-colored clothing, such as a T-shirt designed for dogs. Provide your dog with a shady spot to escape the sun’s rays and be especially vigilant about midday sun, which is more intense than at any other time of day. 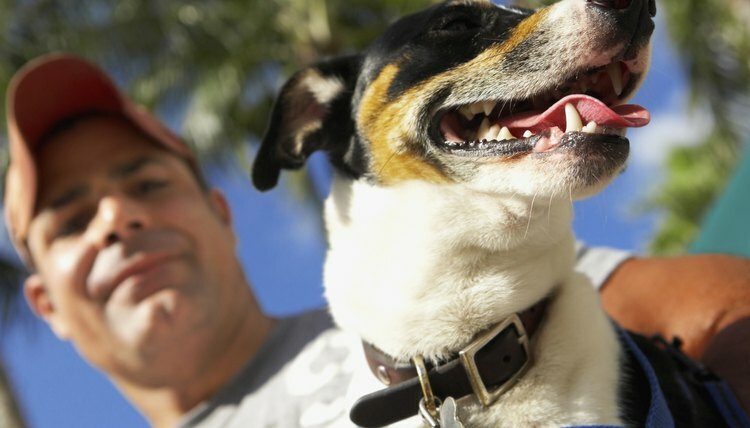 Cesar’s Way: Your Dog Needs Sunscreen, Too!